Description: Nice Large 3/4 Groove Axe - PA - This large Axe I Purchased from heir of finder in Philadelphia, PA. I have not washed it at all....... so far. It has a nice bit, a well made groove and is nicely made. 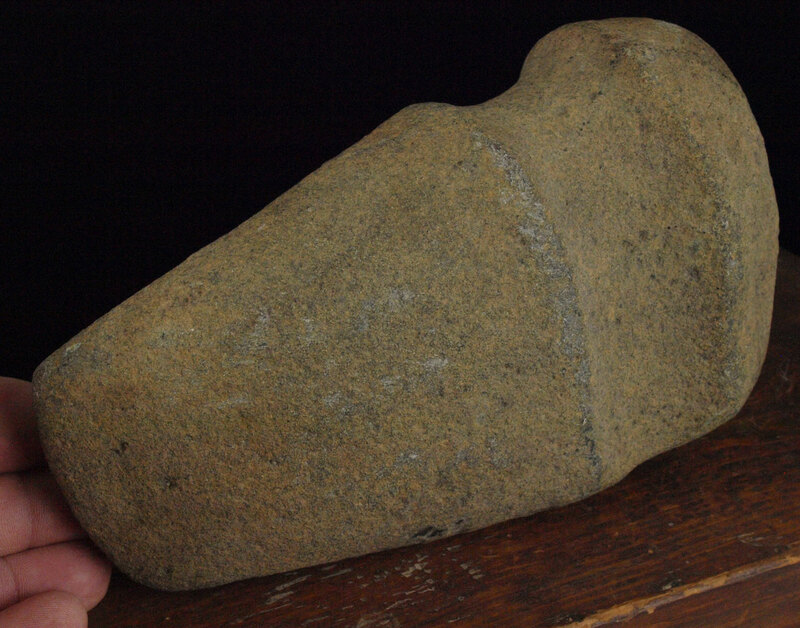 It shows signs that it may have been used as a door stop as many of these were on farms. It is almost Eight inches long and weighs over 5 pounds. Description: Hardstone Adz - This nice Adz is out of the Potts collection from Adair County, Kentucky. It is nicely polished and has a nice bit. 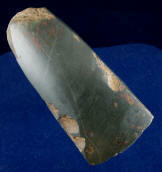 Description: Highly Polished Hematite Adze - Here is a very nice Hematite Adze that is highly polished. It has nice symmetry and form. Ex- Tom Davis. Description: Cotton Rock Adze - Highly polished. Very Light! Cotton Rock is highly collected material. Found in Madison County, Kentucky. 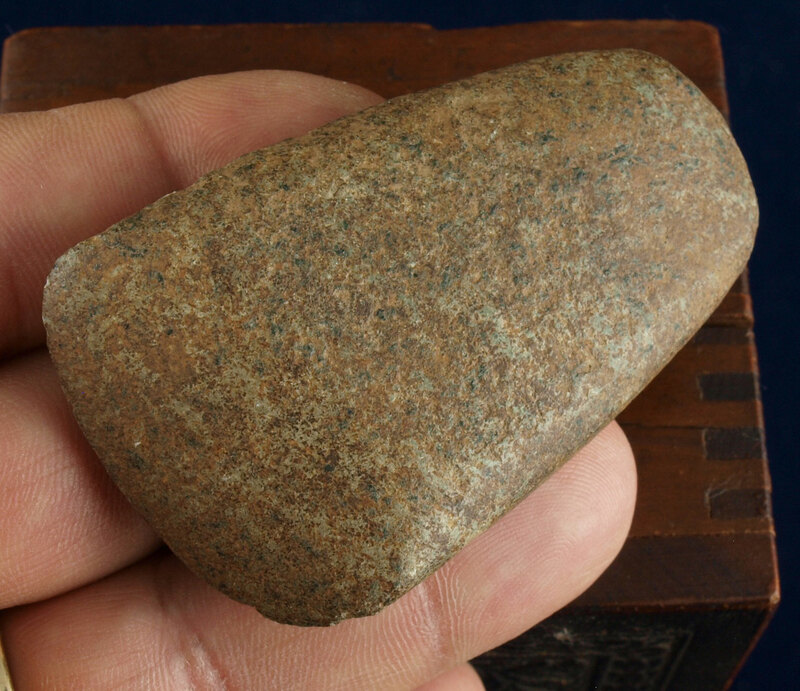 Description: Thin Missouri Limestone / Greenstone Celt - This Celt has a nice bit. It was found in Missouri between 1940 and 1965 by J. McClellan. Description: *Rare* Large, Polished, Hard-stone Pendant - This Super Example was a Personal find of Jeff Bayless at Devil's Play Pen Site, a Sink Hole Shelter find, Warren County, Tennessee. Hardstone Pendants are more rare and this one has nice symmetry and is very well polished. 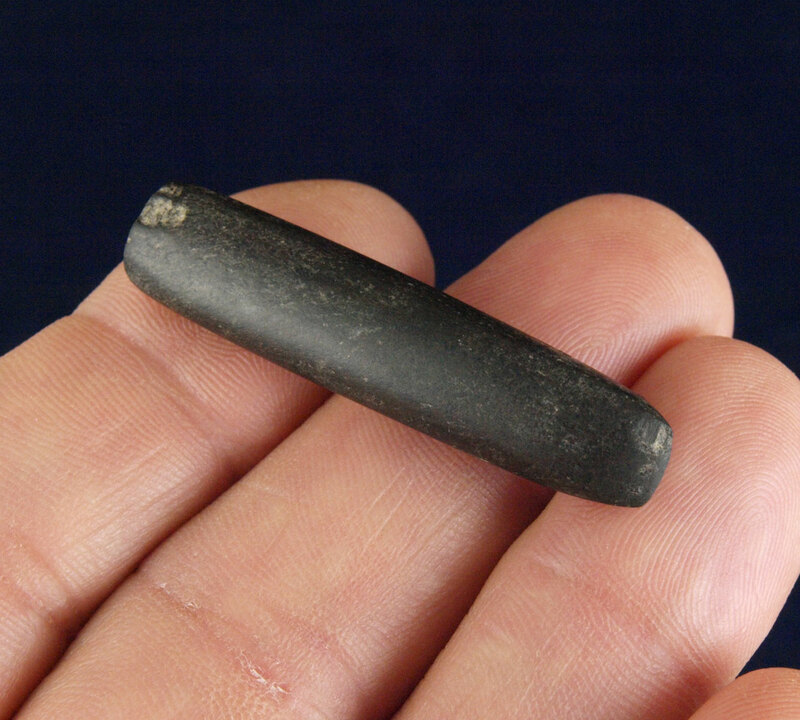 Description: Very Nice Miniature Hardstone Chisel - This little guy was found in Ohio. It shows slight pole damage like many chisels do. It has a nice bit and great symmetry. Description: Truly Fine Miniature 3/4 Groove Quartz Axe - This Fine example was found in Illinois. It is made of Pebble Quartz. The is evidence of Red Ochre on it. What I love about it is that you can still see signs of the "peck & grind". Grade G-10+!